I am an engineer working for Microsoft in the Pacific Northwest. When I’m not writing or coding, I play retro video games and serenade my wife and son with my ukuleles. In May 2010 I joined Xbox Live Studios at Microsoft as a Software Development Engineer in Test, where I worked on Video Kinect and the Xbox 360‘s Windows Live Messenger integration. Later I moved onto the Xbox 360 platform team proper and worked on 2011’s expanded Facebook integration. In 2012 I worked on several marketplace features, including Pins and Recommendations. With the end of Windows Live Messenger in 2013 I helped remove that integration from the console. After that I moved onto the Xbox One shell team, where I was the end-to-end test owner for Subscriptions and Gold Upsell. After Xbox One shipped, I shifted from software testing into a data engineering role, helping build data pipelines to gather and analyze product telemetry and online customer feedback. At the end of 2016 I left Xbox and to take a developer position working on Windows. I am currently a Senior Software Engineer on the Developer Ecosystem Platform team, which owns the UWP and XAML technologies. In 2017 I built infrastructure for performance testing the Xbox UI for the Xbox One X release. In 2018 I built the XamlDirect API, which enabled middle-ware developers to build XAML UI in code with the same performance characteristics as XAML markup. In 2019 I began working on React Native Windows. Prior to joining Microsoft full time, I worked there as a contractor. In July 2008 I took a developer position on their internal Network Security team, writing corporate forensic and monitoring software. After that I worked as a software tester for the Zune PC Client team, writing test automation for the Zune Marketplace. In May 2006 I earned my Bachelor of Science in Industrial Engineering and Operations Research at the University of California at Berkeley. As a part of my studies I designed software for various organizations, including databases and simulations. In addition, I helped develop optimization algorithms for retail labor-hour allocation and international disaster response. I love to play the video games of my childhood, through the heights of the 8, 16, and 32bit console eras. I have multiple original consoles, but I’m not a complete purist – I also have a variety of modded, knock-off, and third-party systems. I also like to build custom hardware of my own. 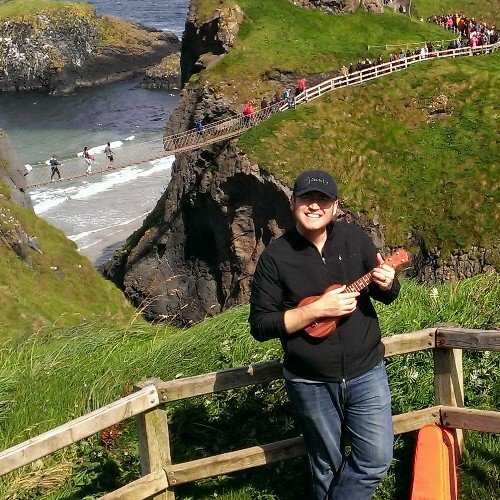 I first picked up an ukulele back in 2002, but without any guidance my interest waned. Ten years later a trip to Oahu rekindled my love for the instrument, and I’ve been playing regularly ever since. At times I’ve had upwards of eighteen instruments in instruments in my ukulele stable. I mostly play Hawaiian music, especially in the slack key style. And he nerded as never before. I have been writing fiction since college; most of my writing is available here on this site. I prefer to write short stories, though thanks to NaNoWriMo I have several unfinished (and unpublished) novels under my belt. I was first published in SMITH Magazine‘s Not Quite What I Was Planning: Six-Word Memoirs by Writers Famous and Obscure. In 2012 I published my short story Pawsgaard, prequel to my unfinished novel, “Hester and the Kookaburra King”. Right after college I served as a Peace Corps Volunteer in Zanzibar, Tanzania. I taught computer studies at Mikunguni Technical Secondary School to its students, staff, and faculty. I also provided technical support for several Zanzibar schools, teacher resource centers, as well as the Ministry of Education. With my fellow ICT volunteers I developed improved education materials and methodologies for teaching technology in developing nations. I am a strong supporter of the Free Culture Movement. I understand that all creative works are built on the shoulders of the creative works of others, that no person can claim to have created anything without having been inspired, influenced, or taught by the works of those before them. I recognize that my writing is heavily influenced by what I read, and so I try to give back by releasing everything I write under Creative Commons Licenses. Likewise I know that my coding benefits from my access to others’ code, and so I release all of my software under Open Source Licenses.